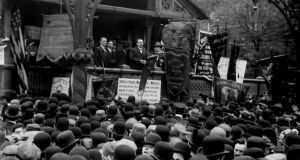 A new exhibition which has just opened at the Irish Consulate in New York, throws interesting new light on Irish socialist leader James Connolly’s years in the United States between 1903 and 1910. The exhibition follows Connolly through a series of newspaper clippings, posters, pamphlets, photos and his own writings in the Harp, newspaper of the Irish Socialist Federation. This story is featured in today’s (28th September) Irish Times – you can read the full story here.